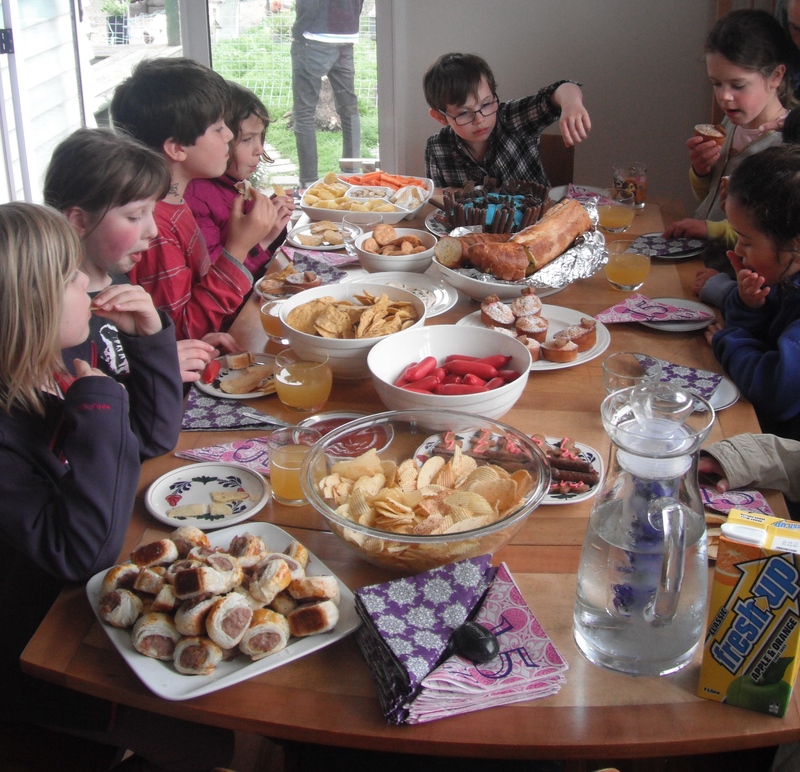 Yesterday, we on the Homestead stepped out of our comfort zone, faced our demons, took a deep breath, girded our loins…and hosted a party in belated honour of Farm Girl’s eighth birthday. This truly was a Greater Love Hath No Man moment. You require proof? The last time we ventured into this twilight zone of social etiquette was when The Farmer (who celebrates 20 years of living and breathing next Saturday) turned five. Way back in January, when school began for the year, her birthday seemed a very long way away. Surely by the time it rolled around we would have undergone some wonderful shift in collective personality and relish the idea of meeting the party expectations of a bunch of other people’s kids. It’s only fair, we told each other with increasingly manic, wild-eyed stares, Farm Girl be allowed to experience this basic social right. Then, suddenly, the day was nigh and, despite the absence of any social enlightenment, we had a party to plan. Oh the minefield we negotiated: goodie bags, an appropriate theme, how to cater to the vegan/raw food/ gluten-lactose-dairy intolerant, how to meet all those party expectations. It took a while for sense to reassert itself but finally, after a great deal of consultation with the girl of the hour, a menu was compiled, appropriate party games identified, and a basic party agenda true to our anti-consumerist, low carbon footprint, simple life ethos drawn up. We opted for the idea that less is more, and breathed a sigh of relief when the day dawned sunny. 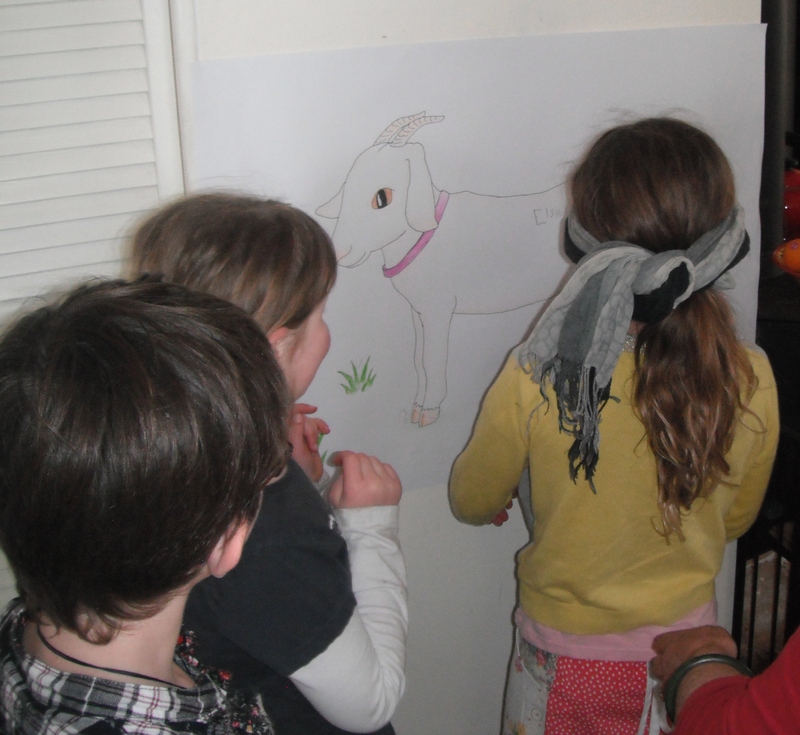 and a rousing game of Pin the Tail on the Goat. 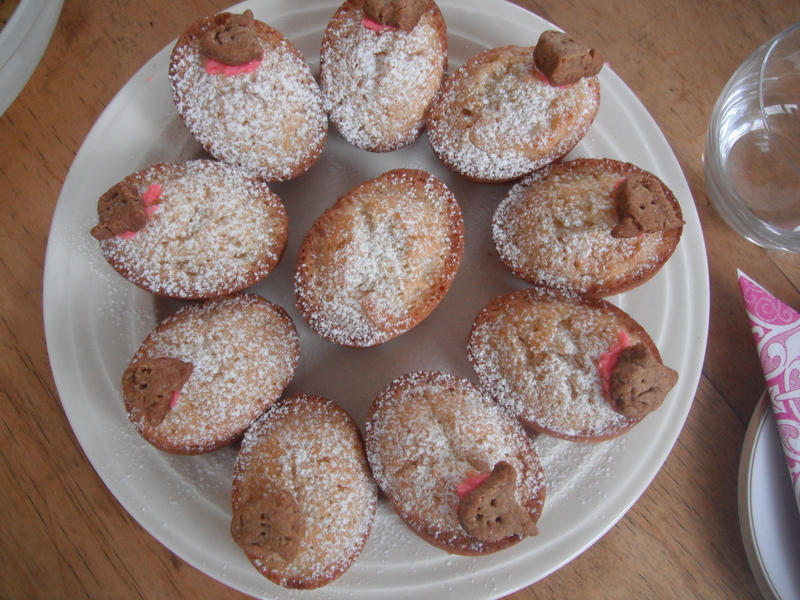 in the shape of goatie friands! Then it was outside again for organised games on the Homestead driveway and/or monkeying about on the climbing frame before a couple of spirited games of Musical Mats (softer than chairs) to the Birthday Girl’s musical choice (“I’m a Believer” by the Monkees) and it was all over, Red Rover. Children’s Birthday parties? Love them or leave them; but the broadness of the smile on Farm Girl’s face last night made us all very happy we’d bitten the bullet and given it a sociable whirl. 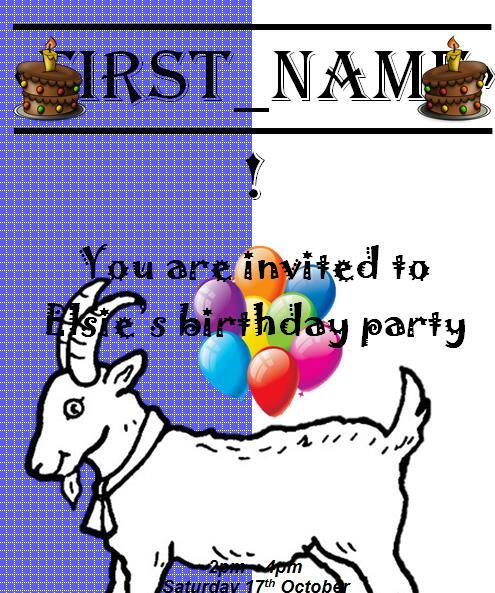 This entry was posted in Family, Union Homestead and tagged barnyard party, birthday, birthdays, children's party, conversation, Family, farmyard party, kids party, love, parties, party, social. Bookmark the permalink. Happy Birthday to Farm Girl! 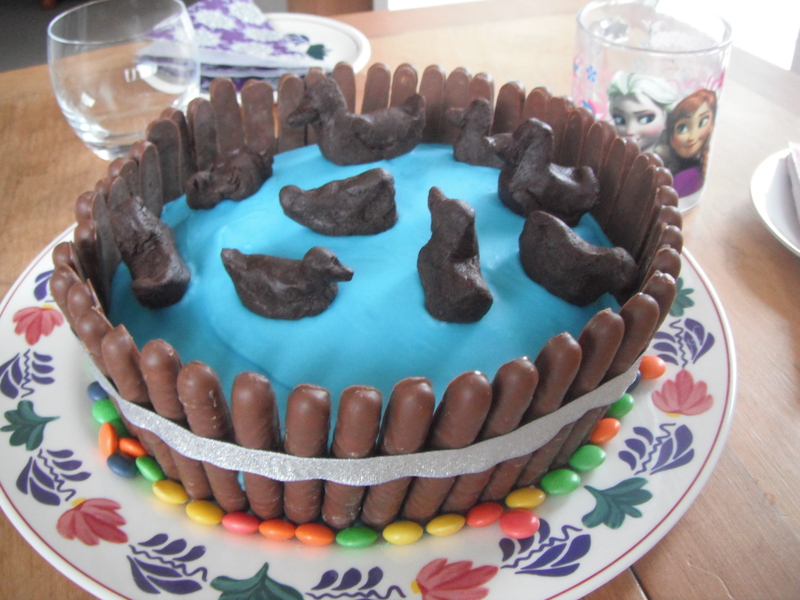 What a splendiferous cake – I love chocolate fingers, and is that a Frozen tumbler in the background? Sounds like it was a wonderful day for her, well worth the effort. And you did it all without a kitchen – you deserve a medal for that! Yes, indeed, Farm Girl’s most cherished Frozen glass is in the background. I will pass on your birthday wishes. It was indeed worth all the worry, effort and general examination of our psyche but will we be doing it again next year? Not so sure. Oh, and the kitchen thing…so looking forward to it being a done deal! Sounds like a lot of fun, well done everyone and belated happy birthday greetings to the star of the day. Well done and congratulations! I am so pleased I don’t ever, ever have to go through all that EVER again! You did marvellously and the photos look wonderful! 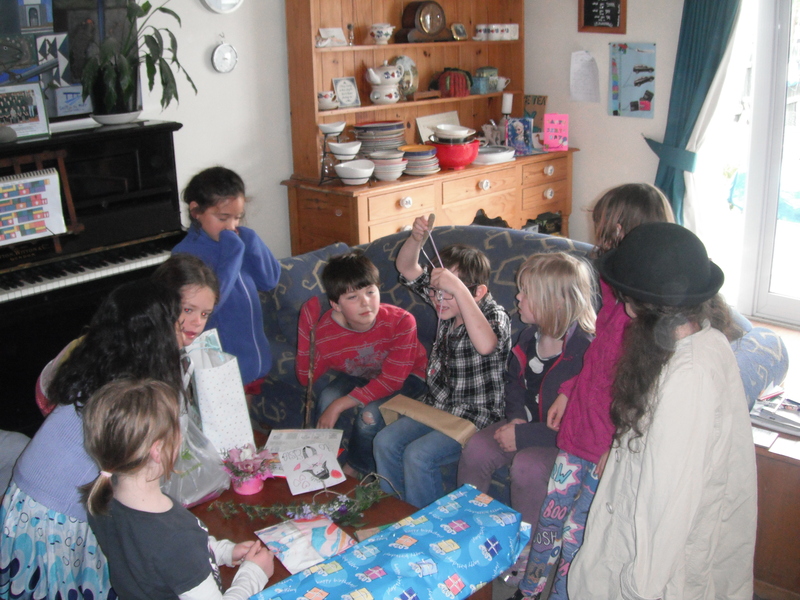 My eldest daughter insisted on parties every year, with themes to begin with and then sleep-overs (sometimes camping in the garden). You realise (?) you may have started something that will be very difficult to get out of next year! You are also very honest, which we love you for. This party will have to do her for a great while because we adult Homesteaders are still recovering from it!